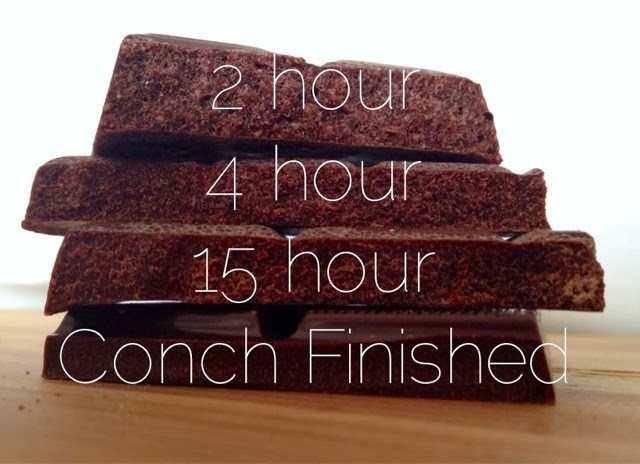 Fresco Chocolate conch time comparison. Behold, one of the most fun chocolate comparisons I've had the pleasure of tasting, all thanks to Fresco Chocolate. Chocolate conched for different amounts of time along the path to becoming a world class chocolate bar directly points out what impact conch has on chocolate texture an flavor. 2 Hour: Gritty texture with bits of chocolate and I what feels like really rough sugar. Some astringency leaving my mouth dry. The taste was tart, like a strawberry that isn't quite ripe, or maybe strawberry jam made without enough sugar. 4 Hour: Rough texture but no longer gritty. Still a bit of astringent but the acidity is starting to show up more. Now the taste reminds me of tart strawberry jam. 15 Hour: The texture has come a long way and I could call it creamyish but not completely silky yet. The acidity that I tasted earlier in now turning into a nice fruity flavor with much less tart notes and more chocolate is coming through. This time it tastes more like a chocolate covered strawberry. The Finished Peru 225 Bar: Oooh the melt is here, smooth and slow, just like a world class bar should melt. The flavors have transformed into a deep dark chocolate with coffee notes. This time chocolate is the first thing that you taste, then the acidity peeks through now and again as fruity notes but not so strong that I could assign a particular fruit flavor to it. Mostly deep, dark, chocolate. Special thanks to Rob and Amy at Fresco Chocolate for sending me this chocolate experience! If you are looking for Fresco Chocolate Bars check out their "where to buy" page from their web site.